LinkedIn; Open BC, Soflow and Ryze; social networking sites; WorldWIT; Yahoogroups. Creating profiles, connecting to people, introducing yourself; creating a database of contacts. Quantity vs. quality, your online vs. offline networks; integrating the two worlds. Chapter Three: Who Are You Online? Your presence on sites and forums; your offer of help; reciprocation; photos and files; Gather; Ezinearticles.com, article marketing; Blogging. "Liz Ryan has created a book that is an intelligent and witty guide to online networking in writing 'Happy About Online networking.' Finally we have an easy to read, easy to understand and step-by-step guide to effectively using networking in your life, business, and career. 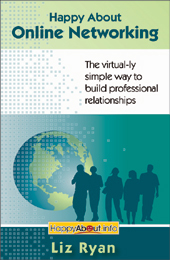 If you buy one book about the exploding use of networking, buy this book." "I've been waiting for this book for a very long time! But, more importantly, I've been waiting for the right person to write this book with the right tone. As an opera singer, master online networkier in charge of a growing empire of over 50,000 members, and an exquisite writer who understands the subtleties as well as the power of tone in online communication, Liz Ryan is just the right person to write the book I've been waiting for all these years. Indeed, if you want to exploit the tremendsous benefits of onine networking for your career, business, or social cause, you should read 'Happy About Online networking.' "
"If you've been hesitant to enter the online networking sphere, wait no more! This book is a comprehensive guide to navigating the worldwide web of social and business networking online, filled with concrete tips and valuable resources." Job-seekers, business-developers, and all sorts of professionals are exploring the fast-growing world of online networking. But how do you plunge into the online networking sphere, and how do you gain value from it? 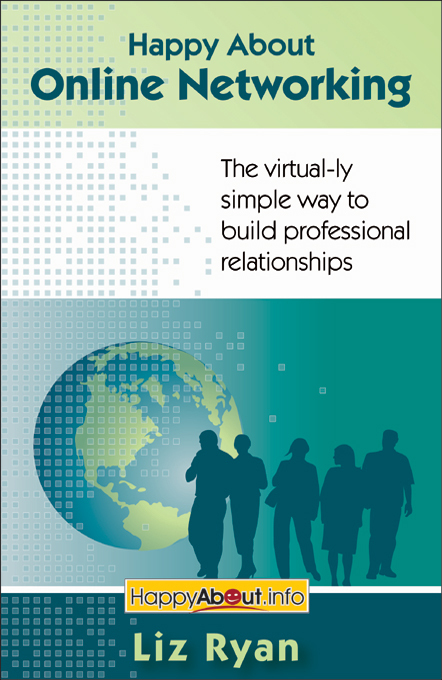 This book outlines the tools, methods, and protocols of creating and cultivating an online network for global reach, business and personal support, and professional success. From how to introduce yourself to how to disengage from an unproductive networking relationship, Happy About Online Networking covers all the bases. Liz Ryan is a former Fortune 500 executive, serial entrepreneur, and expert on the new-millennium workplace. Liz was VP of HR for U.S. Robotics throughout its period of rapid growth in the 90's, and co-founded software startup Ucentric Systems in 1999 (now a division of Motorola). Liz founded Liz Ryan Consulting in 1997 to advise large employers and startups (DDB Needham, NBCi, Looksmart, et al) on their HR and organizational strategy needs; and in 1999 she founded WorldWIT, now the world's largest online network for professional women.